I’m pretending to study the delicate hem of the dress, hanging on the Godfrey Dean Gallery walls, at Sonja Pawliw’s opening. My interest is feigned, not because the work isn’t incredible, but because I’ve already looked at the clothing. I’ve come back to this corner of the gallery only after spotting Pawliw; I want to get close to find out more about her. Moments earlier I had surveyed the room wondering who, or where, she might be. I scanned attendees gathering around the high-heeled shoes covered in ceramic mosaic, the felted landscapes, alcohol and ink paintings, acrylics and photography and guessed she was the short, silver-haired woman surrounded by a crowd of older ladies fussing over her. As soon as I move close and start eaves-dropping my suspicion is confirmed. Now that I’ve found her I have more questions. Where did she learn to work with different media? And who inspired her to become such a prolific artist? I can’t help but interrupt her conversation. I look at the skin around her lips, her eyes and thinning hair and figure she must be close to eighty. “Are you still making things?” I ask cautiously, hoping she’s not offended by my question. “Of course!” she shoots back before she is steered away for another photo. I came to the show today because I wanted to meet the woman described on the gallery’s website as a “maker long before the term became popular” and view her diverse body of work. Now I’m more curious than ever and decide I need to see her kitchen table for myself. A couple months later the gallery director, Don Stein, agrees to introduce me to her. It’s a frosty December morning and I take a picture of her hand-crafted mailbox, covered in a mosaic of broken dishes and drifting snow, before knocking on her door. We step inside the small bungalow and I immediately see her table. It’s right beside the front entry and just like she had described, clearly with a project on the go. Christmas carols play in the living room while Ukrainian music comes from the back of the house. She puts a tiny kettle on her stove and I wander around, trying to take in the paintings, macrame, mosaics, paper tole, knitting and art covering every available surface. 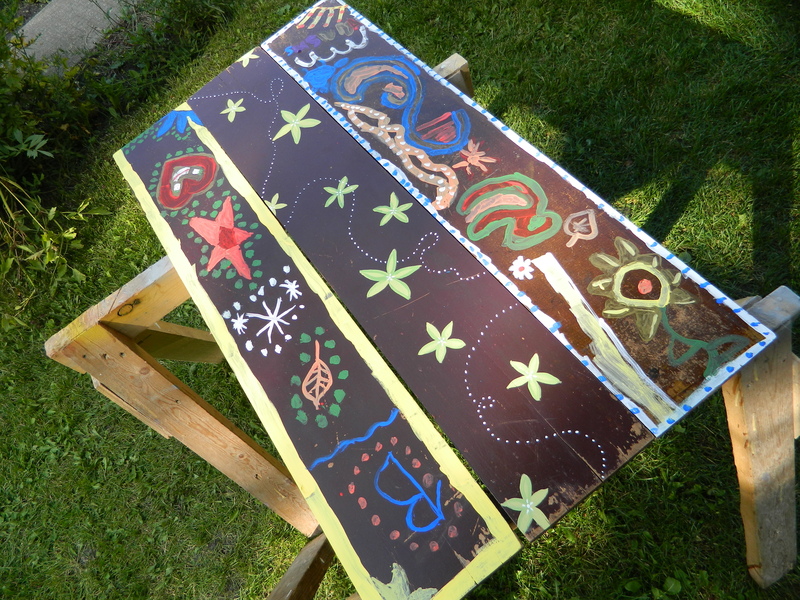 I pull a stool up to her kitchen counter and ask, “How did you become an artist? How did all of this happen?” They’re loaded questions, ones that will take hours to answer, but Sonja loves telling stories. She talks quickly and takes big breaths so she can carry on with the next phrase. She tells me about gardening with her grandma (who she refers to as an angel), beekeeping with her grandpa, catching sparrows, snaring rabbits and harvesting wild honey. It reminds me of the exuberant curiosity I sense in her art work. Everything from from her hand-dyed silk scarves to her embroidery to her writing and illustrations embodies her quest—even personal challenge—to curate beauty. I’m trying to imagine how she did it all while she hustles me toward some rocking chairs covered in sheepskins. How did she have time for creativity, as the mother of eight children, while working on the farm and holding a job at the hospital? And what did other folks think when her sprawling art projects took over the home? During our visit I’ve been trying to peg her age. Finally, she tells me she is 91. “Ninety-one?” I echo, not sure I heard correctly. She is, after all, still producing more pieces for an upcoming gallery show in Saskatoon. In fact, she’d just told me she doesn’t have time to relax these days because there is always something she needs to make or do. Suddenly she gets quiet. She looks down at her hands on her lap, the hands that have sculpted, molded, painted, sewed, gardened and shaped her work for nearly a century. When she looks up I see tears in her eyes. “You know,” she says, her voice soft with emotion, “I’ve always prayed, Lord, if there are people who aren’t using the energies and talents you gave them, can you pass them on to me?” She pauses and looks at her snowy apricot tree on the other side of the window. My rocker creaks while I finger the knitted scarf she just gifted me. It’s apparent that Sonja Pawliw got what she asked for. Note: I wrote this article for the Godfrey Dean Art Gallery in December 2018. Many thanks to Don Stein for the invitation and Sonja Pawliw for the visit. It is an honour to write about such a remarkable woman… 800 words barely scratches the surface! I’ve been trying to come up with a story or something meaningful to blog about so I can sneak in propaganda* about Wonderscape. The problem is I don’t have anything funny or thoughtful that I can spin into Come to Wonderscape. Especially not before I have to get off-line and pick up my three -year-old from her play-date. So there it is. Come to Wonderscape. Sign-up before Friday (the early-bird deadline). Sign up before it fills (less than 10 spaces left). Sign up if you want to talk about success and failure and how it affects our artistic journeys. 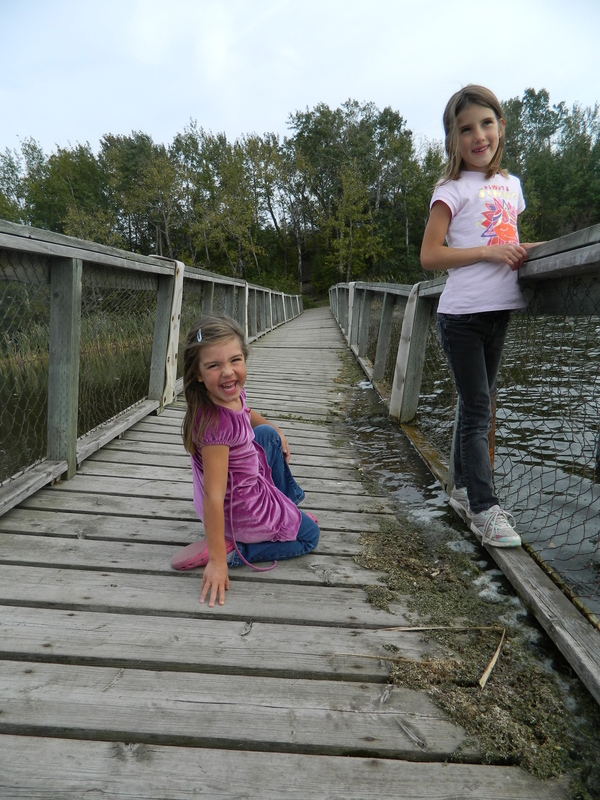 Sign up if you like autumn, lakes and prairie skies. Sign up if you want to create, eat, then create and eat again. Sign up if you’re a professional artist. Sign up if you are an amateur. Sign up if you live across the country. Sign up if you live next door. On the way to school this morning I told my daughters I was doing a radio interview today on Wonderscape. *Propaganda is the Spanish translation of “advertising”. It doesn’t carry the same negative connotations as it does in English (which might be why I get funny looks when I use it) and is more fun to say. 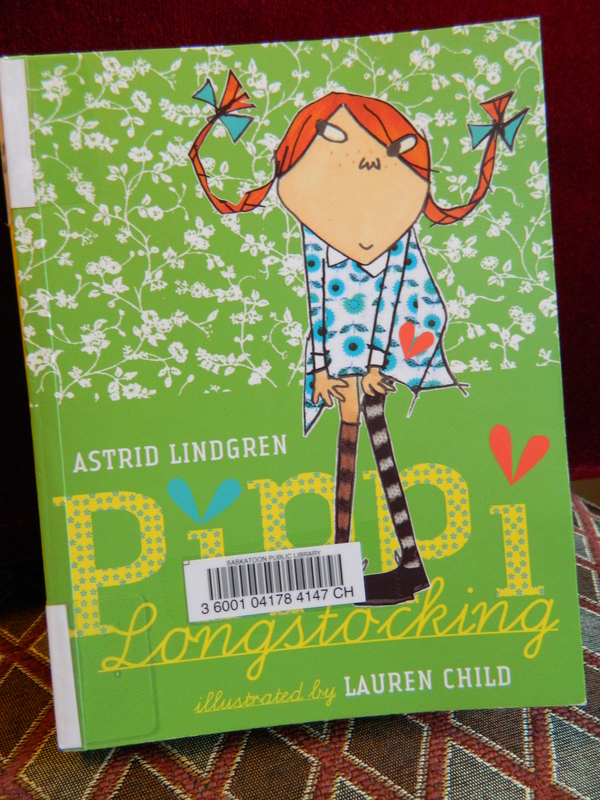 Last week we started reading Pippi by Astrid Lindgren. My daughter’s recent fashion leanings inspired me to order the book from the library. 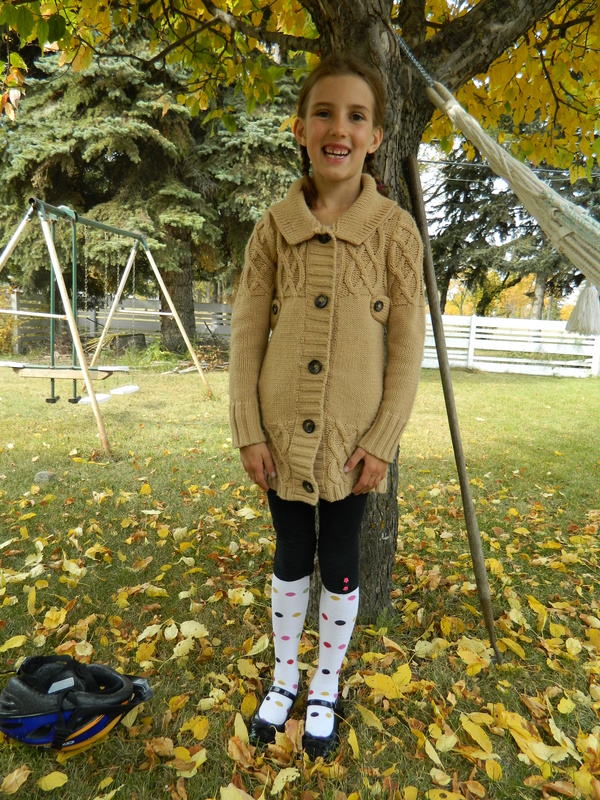 Her sock-wearing habits are pippi-ish, don’t you think? I remembered reading Pippi when I was a girl, but I had forgotten what it was that I liked about her. After turning the last page of the book and setting it down on the couch we decided it was her unpredictable, creative, and confident character that made her so likeable. I had a staff meeting this past week during which we spent a good chunk of time talking about homework and how to get the students to do it. Then I came home and opened up Pippi where we had left off the night before. Ironically, we were at the part where she goes to school for the first time. I have to admit, it was delicious reading, especially after coming home from my meeting. ‘Well, what do they do at school then?’ asked a little boy. ‘But what does the teacher do?’ asked a girl. Just so you know, if you invite either of my daughters to your child’s birthday party they will probably end up receiving a copy illustrated by Lauren Child. *My own end of the week tradition: words in song or story that move me in some way. I might type my very favourite parts in bold text, and I’ll always try to post a link below the quote so you can get more if you want it. Enjoy! Good Words: Do you want to come along? Our family returned home from a long day away recently. While I was taking off my shoes, I saw the red light of the answering machine blinking across the kitchen. We all listened to the message while tripping over each other, shedding our jackets and bags. 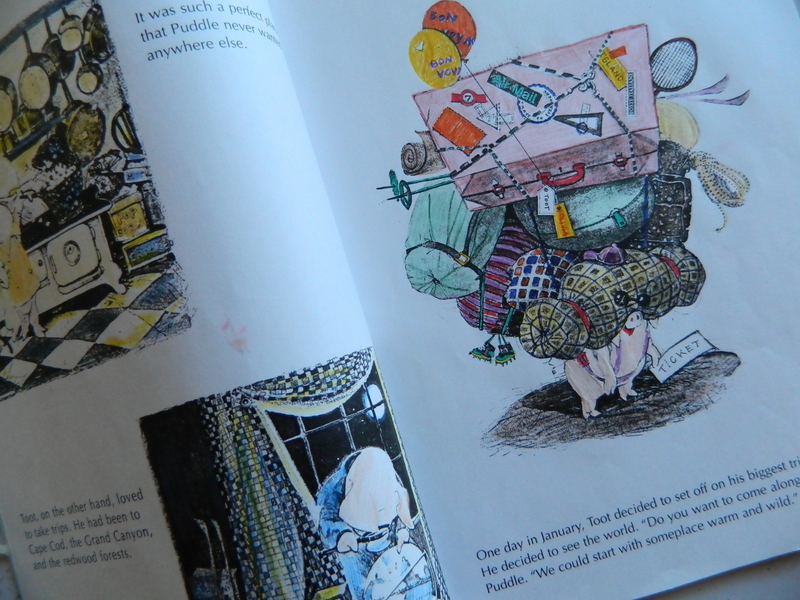 She is also one of the friends who photocopied Toot and Puddle by Holly Hobby, coloured it, and gave it to me before I left for South America. Puddle preferred to stay home. It is a tender story of friendship, travel, and being content at home. The pictures are wonderful; especially when coloured in pencil crayon by some best friends! I pulled this book from my daughters’ shelf and read it to them again this week. Even though we are not in a see-the-world space right now, like I was when I first read it, it makes me smile. And to be honest, I’m happy to be the piggy at home, for now. “Open up your mouth, Belén. Mmm… I like the way your jaw is widening for your top teeth, but those bottom teeth are going to need more space…,” Stan says thoughtfully, keening forward in his seat to get a better look. Belén closes her jaw and keeps playing with her puzzle. “You mean orthodontic work on her,” I correct him. My husband is neither an orthodontist, nor a dentist. Not even close. But, he’s not joking. Those of you who know him will also know that he is completely serious about wanting to tackle our daughter’s mouths. In fact, I can see the gleam in his eye as he thinks about outfitting our daughters with retainers, braces and other apparatuses made with his own hands. As much as I admire his skill and handiwork, I am still reluctant to give him the go-ahead with this project. After all, they only get one mouth. A half hour later, he’s offering me new ideas, hoping I’ll jump on board. While draining some beef broth from the bones, tidbits of meat, and chunks of fat, I can see his mind turning. I shake my head. “Nope. I’m not doing that,” I respond quickly. The idea itself isn’t a bad one–we’ve rendered fat before for making soap and Stan’s made several batches himself–but the timing is wrong. I don’t have the energy for soap making and correcting spelling assignments today. He is now finished separating the broth from the bones and stands back to look at the pile of bones on the counter. I think I have a very unique, interesting, special partner. Someone I am attracted to, frustrated with, proud of, and overwhelmed with at times, but never, ever bored with. PS. These are just a few examples I picked from the last two hours. There were more, even in this limited time period; I just chose these to illustrate my point. Were they enough? 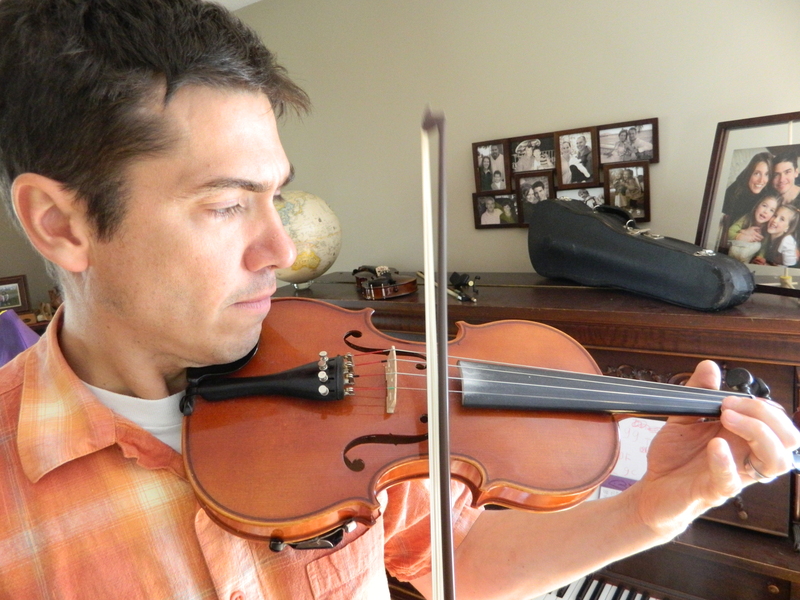 I finished typing this post, while listening to “The Tennessee Waltz.” The music was coming from our living room. You know how Stan isn’t an orthodontist? Well, he doesn’t play the violin either. 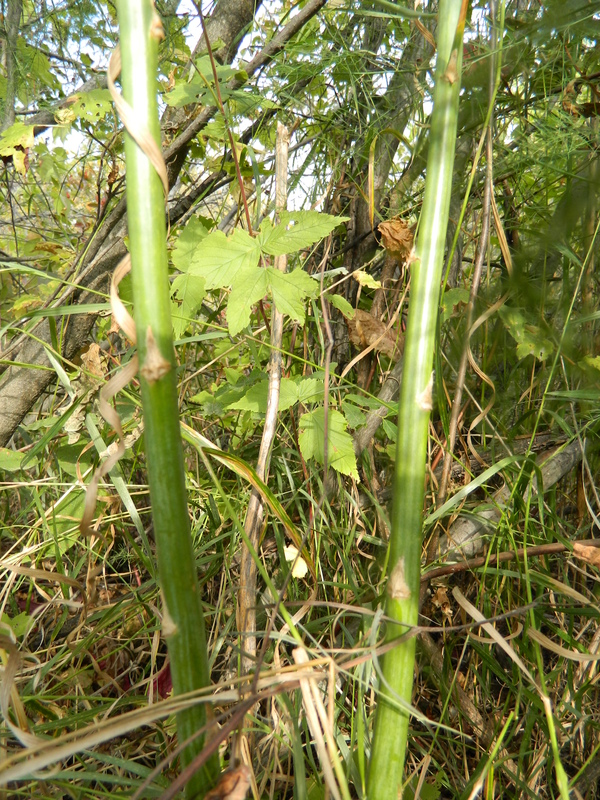 The first was a stand of wild asparagus. I now have two locations, marked off in my mind, where I need to get to eight months from now with a sharp knife. 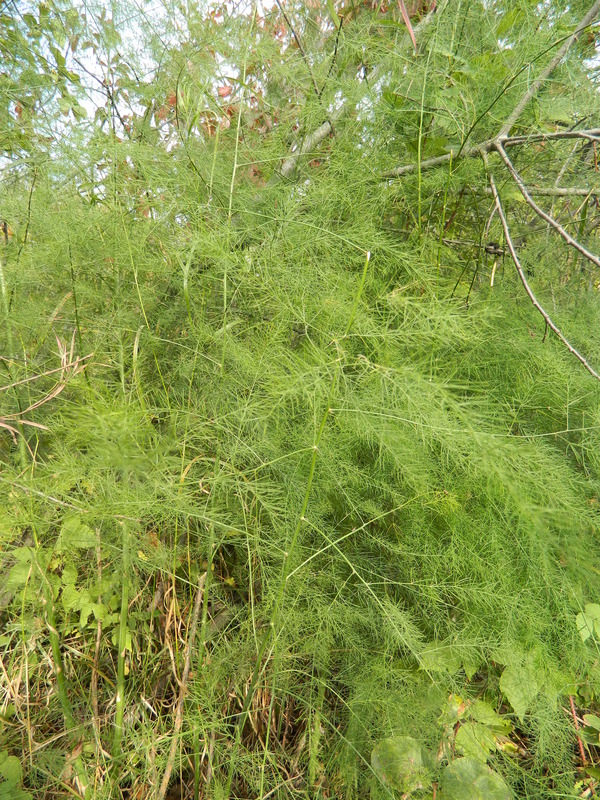 If you see something like this in the woods, you’ve found wild asparagus!! Looking for this is like edible geo-caching. You’ll probably notice the fern-like foliage first. 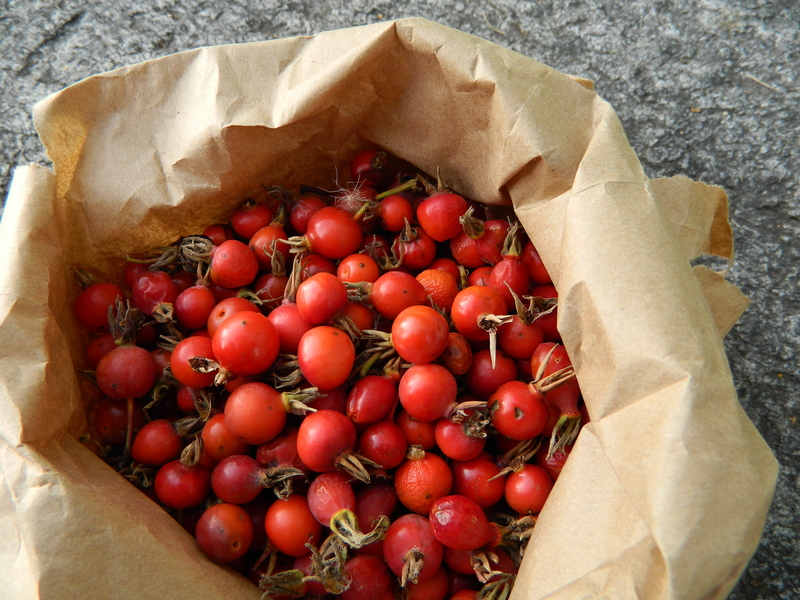 I was planning to save foraging for rose hips for X-country ski season, but these rubies were too plump to pass up. Plus, my daughters decided to play “store” on the trail so picking these hips was the perfect avenue for staying in the game in that my-body-is-here kind of way. Isn’t imaginative play wonderful when you don’t have to do it? Check back, in a few months, to see them made into syrup or tea. 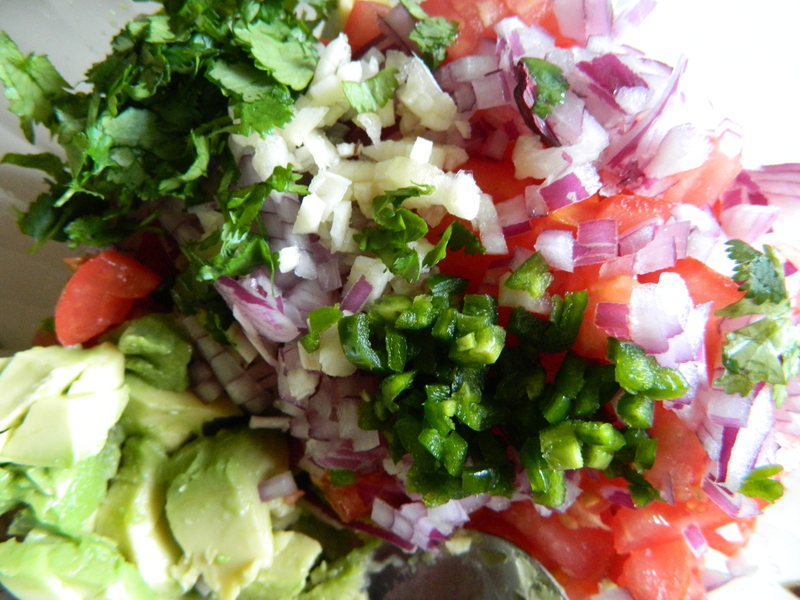 It’s an easy marriage, fresh salsa with fresh guacamole; why make both when you can save a dish? Honestly, before I had children I could read through anything like I would a recipe book. Now, if I detect even a whiff of emotion, my body has no choice. The tear ducts, the throat; they all go on auto-pilot cry mode. It’s rather inconvenient in front of a full class. These words by Cynthia Lord in Rules, are not the ones that made me teary, but I did interrupt myself when I came across them. I stopped, put the book down, and wrote the first line on the whiteboard….and then kept on reading. I’ve only read the first two chapters, but I can tell you that thirty 11 year-olds were captivated by it for at least 1 hour yesterday. 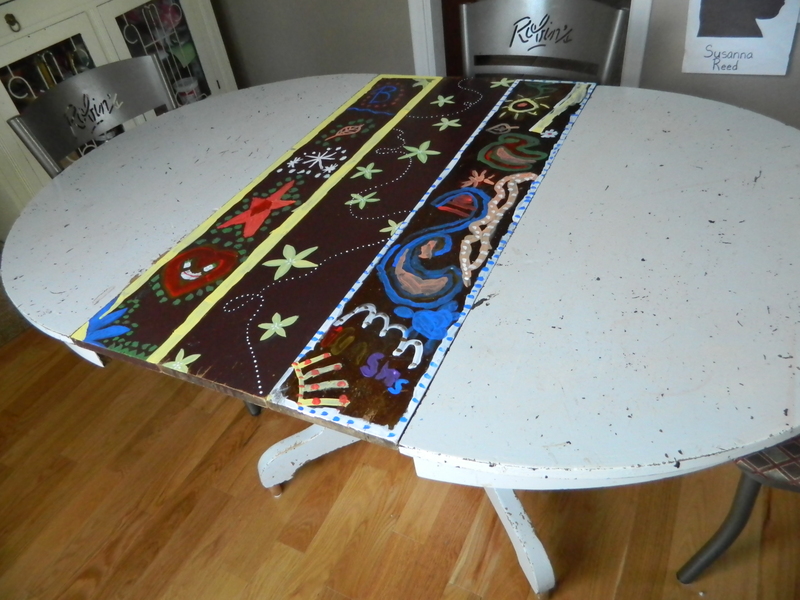 Table Painting: Is this better Mom? My grandparents bought this table shortly after immigrating to Canada. Let’s make a bet. Bring my mother into my dining room and ask her to open up our table to put the extra leaves in, or even wipe it, and I’ll tell you what she’ll say. And then I’ll say, “I love this table!” emphatically. She’ll shake her head and sigh, then we’ll go on to set the table. I know, because we’ve had this conversation at least thirty or forty times before. Well, now we’ve got something else to talk about mom. See how we’ve spruced it up? Wonderful Judy was over the other day, sitting at our table, when she made the suggestion of painting it. I’m not sure why I had never thought of that before, but it was a great project. It turns out table leaves are an ideal canvass-they’re flat and just the right size. It’s nice to find different surfaces to do artwork on as there is only so much wall space available. I was going to let the kids do it, but then I couldn’t resist and got my own leaf to paint too. The finished product. Now we don’t need to run for the table cloth when guests come anymore.